Delta Dogs is a community supported collaboration that grew from a shared love of animals, and the relationships and service that we aim provide to the community in need in Mobile. Delta Dogs is a nonprofit, tax-exempt charitable organization (tax identification number 47-1605219) under Section 501(c)(3) of the Internal Revenue Code. Donations are tax-deductible as allowed by law. 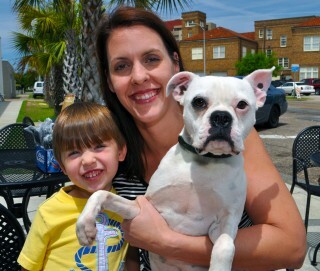 Dr. Eiland and her son, Andrew, with their rescue dog Dave the Brave, a disabled Boston mix. Born in Millbrook, Alabama, Dr. Wilder has always had a deep love for animals. As a result, she began volunteering at a local veterinary clinic at the age of twelve. She was eventually hired on at the clinic and continued working there while pursuing her high school, undergraduate, and graduate education. During this experience, she discovered how important it was to be an active part of the community, and help both pets and owners in any way she could. She moved to Mobile shortly after graduating, and has been in love with it ever since. Ark Animal Clinic and Rehabilitation Center opened its doors on June 7, 2010. She has a daughter, Hannah, and a son, Andrew. Her family also includes her husband Ryan, Olaf, Frank, Dave the Brave (the pups), and Monkey, Scrappy, SpongeBob, Patrick, and Smushi (the cats). In her free time, she enjoys reading, horseback riding, running, scrap-booking, and traveling. Dr. Wilder has a strong interest in animal rescue work, and a passion for helping animals that are not getting the care they deserve. Dr. Wilder has a Doctorate from Auburn University’s College of Veterinary Medicine. 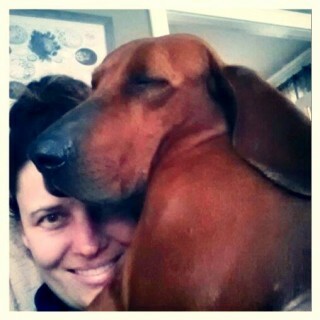 Jennifer and her Redbone Coonhound, Miss Daisy, who was rescued after being hit by a car. Originally from Boston, Massachusetts, Jennifer moved to Mobile and, like Dr. Eiland-Wilder, immediately feel in love with the Azalea city. During the day, she is a marine biologist who specializes in oysters and marine and coastal restoration, but in her free time, she is The Director of Operations at the Delta Bike Project (DBP), a non-profit community bike shop, and manages Delta Dogs with Dr. Eiland-Wilder. At the DBP, her hounds Charlie and Daisy join everyone fixing their bikes. Many people who are either homeless or in need have asked her for help with their pets based on conversations at the DBP – spay/neuter, warm bedding for winter nights, pet food, flea and tick medicine, etc. This was part of the beginning of Delta Dogs! She joined forces with her friend and personal Veterinarian to fill this unmet need in the community. Jennifer lives in Mobile with Charlie and Daisy, and enjoys cycling, saving hound dogs in need, and giving back to her community through stewardship and service.